Debate: "It's Just War - Should Christians Fight?" For the past three years I have dedicated the majority of my research to Constantine and the John Yoder claim that the church "fell" under the Roman Emperor who claimed to have become a Christian. This research led me to study how the early church interacted with the Roman military. I have been reading church fathers, academic studies and Anabaptist materials. Recently I found a video of a debate between two Non-Resistance adherents and two academics who hold to the "Just War" theory. I was already familiar with one person on each side: David Bercot has written a few books on the early church, and Peter Kreeft, a noted professor of philosophy. I have written fairly critical reviews of Bercot's work on this site. Around 25 years ago I read Kreeft's text, Making Choices: Finding Black and White in a World of Grays. This text made a good impact on my spiritual journey. Throughout this article I will be referring to time marks in the online video of the debate AND giving "quotations." I use quotation marks here because I am NOT claiming that my "quotations" are perfect. You might want to watch the debate before you read my thoughts on the matter. Each man gives a 5 minute opening address and all five do a good job of laying out their views. This is a good video presentation and is a good learning experience for anyone. Something that I find puzzling with the Anabaptist/Pacifist position is their consistent desire to cite evidence from the early church. They do this, in my opinion, because there is no clear evidence from the NT - there is not a single passage in the NT that commands Christians to abstain from serving in the military or from government service. There is no clear command restricting Christians from protecting themselves and their families if/when a thief, robber or criminal were to come into your house. Because of this, Bercot goes to a few early Christian writers for support. Bercot's position is that the early church had a unified voice against Christians serving in the military. He does, however, qualify his statement by saying that any father who says anything definitive about the military takes this stand. He is correct if you read these select writers at face value, but just as you must be careful reading Jesus in a simple, literal fashion, you just cannot do this with the early fathers. The two main fathers who clearly speak against Christians serving in the military are Tertullian and Origen. Readers need to know that the early church had great diversity regarding many, many topics including when/how to baptize, when to celebrate Easter, the nature of Jesus with respect to His humanity, and which documents were inspired just to name a few. Military service is one of many topics where there is NOT a clear 100% voice in the fathers. I doubt Taylor/Bercot would agree with Origen on this. In addition to forbidding military service, most Anabaptist/pacifists (Greg Boyd comes to mind) also argue against nationalism. Both Tertullian and Origen are advocating support for Rome. In the text above Origen specifically says the Roman emperor and his troops are fighting for a righteous cause. So the very text Bercot uses to bolster his position actually goes against his overarching view. THIS is the problem with using the early fathers - they have positions all over the map. I do not really know the "Just War" theory. I have never done any reading/research on this topic - Just War doctrine begins just after my timeframe. From the little I have read, I think I agree with some aspects and disagree with others. It is difficult to feel really good about how the Church became unified with the State AFTER Constantine. Thirty-five years ago (or more) I agreed with around 90% of the Anabaptist views. I was an independent charismatic and had been influenced by reading several authors and hearing different preachers. I did not think Christians should serve in the military or in government. I did not think Christians should be involved in politics - I did not think Christians should even vote. I was also opposed to seminary studies. I was a fundamentalist. I vividly remember getting into a contentious discussion with a few other university pastors at a three week training session in 1983. The pro-life and Jerry Falwell Religious Right movements were getting into full swing and I was uncomfortable with both. It was at this training conference that I first recorded in my journal a vision to do Ph.D. work in early church history and to teach. I had the uninformed opinion that the ante-Nicean Church was the best model after the apostles. In 1989 I read David Bercot's book Will the Real Heretics Please Stand Up. This further ignited my interest in the early church and my desire to pursue a higher education in order to promote the views of the ante-Nicean Church. By the middle of 1998 as I began my Ph.D. studies and had already read 20-30 of the ante-Nicean writings in addition to reading 8-10 great early church historians (Lietzmann, Chadwick, Frend, Danielou, Lightfoot and others) AND 10-15 studies/texts on Clement of Alexandria it was clear to me that I had been misinformed with respect to the Ante-Nicean Church. As in any era, the second and third century church had some amazing stories of courage and had stood faithful through some tremendous trials, but it also had it's share of sinfulness, arrogance and short-sightedness. In short, I became convinced that this period should NOT be considered as the absolute best period of Christian history. Again, you can read my reviews of Bercot's work in which I clearly illustrate how/why his presentation of this period fails any scholarly test. 1. The New Testament does not support their views. 2. The Ante-Nicean Church does not support their views. 3. The exclusivist attitude of the Anabaptists I have read/heard is not consistent with the very message they claim to present. 1. A clear reading of the New Testament does not support their views. The main texts for their views come from a few sayings of Jesus in The Sermon on the Mount. There are no clear NT commands for Christians to abstain from military service, government service, nor are there clear commands against self-defense in all circumstances. Read the evidence and the need to properly interpret the sayings of Jesus from The Sermon on the Mount. You can read the evidence presented in my ebook: Christians, War and Military Service. 2. The evidence of the Ante-Nicean Church does not support their views. 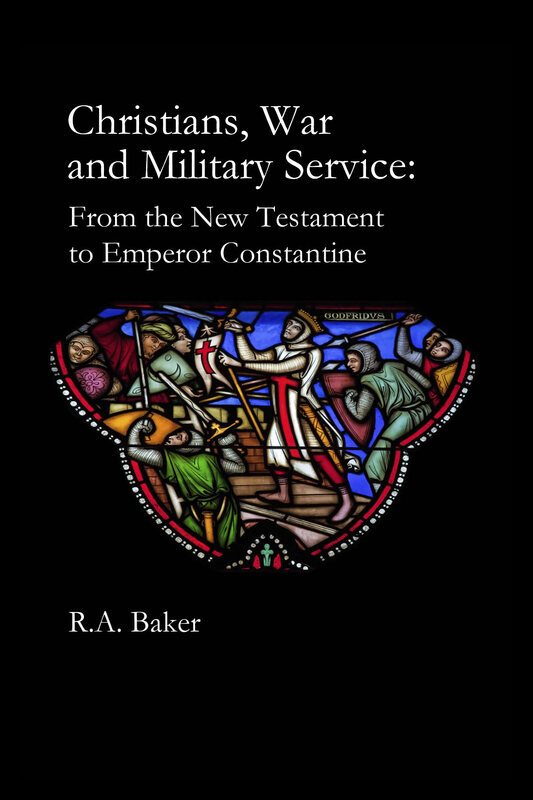 Again, the best place to read the evidence for the second and third century church fathers is my eBook, Christians, War and Military Service. In summary what you will read is that we only have a few early fathers making clear statements against serving in the military, but even these few fathers give caveats which make it obvious that their views are not based on being pacifists. As I mention above, both Tertullian and Origen clearly state that Christians should pray for the success of the emperors soldiers in warfare - do this so the empire can have peace! Secondly, we have numerous data points that show Christians WERE serving in the military as early as the time of Marcus Aurelius in a famous battle dated around 170 AD. In this account Christians are well-known within the troops, thus Christians must have been serving prior to this incident. There are also other data points such as gravestones to Christian soldiers and archeological discoveries of Christian chapels within military installations. 3. These pacifists have an exclusive, "holier-than-thou" attitude that betrays the apparent grace they give voice to in their presentation. When you listen to these pacifist advocates you "feel" a message: "IF you do not agree with the teaching of Jesus on non-resistance (and OUR position), you clearly are not truly following Jesus. Read more about the arrogance of the pacifist movement. Interpreting Jesus: Did He Really Mean What He Said? In his opening statement Taylor explains how he went from serving in the military to becoming a believer in non-resistance. He came to a point where he asked in his heart, "What if Jesus really meant every word He said?" Taylor came to a point where he decided that indeed Jesus did/does mean every word, thus He expects us to obey every word. Taylor basically preached for his opening and closing arguments. Understand, when I heard Taylor preaching, I liked it. It challenges me and I like it. I once believed almost exactly how he (and Bercot) presents his faith. But then I allowed myself to question the text and to think critically. My argument against Taylor is that although Jesus certainly means for us to take His teachings seriously, He did not intend us to take Him literally in EVERY saying. A good study is to take all of the clear commands [the imperatives] from the Sermon on the Mount to see IF we can take each and every one at face value and to apply them literally. Matt 5:16 - ...let your light shine before others, that they may see your good deeds and glorify your Father in heaven. Matt 5:23 - ...if you are offering your gift at the altar and there remember that your brother or sister has something against you, 24 leave your gift there in front of the altar. First go and be reconciled to them; then come and offer your gift. Fairly clear. You could argue, "What if I am on the other side of the world? etc." But the meaning is fairly literal - make things right ASAP. Matt 5:25 - Settle matters quickly with your adversary who is taking you to court. Do it while you are still together on the way, or your adversary may hand you over to the judge...and you may be thrown into prison. Seems clear. Make every good faith effort to negotiate. Notice the text does not say to give in to your adversary on every point - it says "settle." Matt 5:29,30 - If your right eye causes you to stumble, gouge it out and throw it away....if your right hand causes you to stumble, cut it off and throw it away. It is better for you to lose one part of your body than for your whole body to go into hell. Ok. This one is not simple. I know that Taylor/Bercot would not want you to follow this teaching of Jesus literally - we MUST interpret it. Jesus cannot possibly mean that we should REALLY do this, right? I would like to hear Taylor respond to this IF he intends to say that Jesus really means that we obey every word. To continue, we are going to skip the clear ones now and just list the commands that are problematic. We will skip over "turn the other cheek" and "love your enemies" because these are the very commands at issue - we will come back to them. Matt 6:6 - But when you pray, go into your room, close the door and pray to your Father, who is unseen. No open prayer? Not in a restaurant, not in school? We would assume that open prayer in church is ok, but is Jesus saying we should not pray openly EXCEPT in church? Then we have "The Lord's Prayer." So is Jesus saying we should ALWAYS use this prayer when we pray? The Catholics have this prayer incorporated in their prayer beads. Are we failing to follow the teachings of Jesus if we fail to pray THIS specific prayer each and every time we pray? Please understand, I am NOT trying to pick apart the teachings of Jesus, but I am asking the same question Taylor asked: "Did Jesus really mean every word He said?" Matt 6:19-21 - Do not store up for yourselves treasures on earth, where moths and vermin destroy, and where thieves break in and steal. But store up for yourselves treasures in heaven...For where your treasure is, there your heart will be also. If we follow this saying of Jesus literally we cannot have a savings account and we certainly should not have ANY kind of investments for the future, for "retirement." A strict reading would mean that we not even own a house. This is actually how I was taught and lived as a young man. In fact, I lived this way until I was 40 years old with two children 10 and 5 yrs old. This is a lengthy section where Jesus is basically saying "Do not be concerned" with taking care of your daily needs: clothing, food, "But seek first his kingdom and his righteousness, and all these things will be given to you as well." There are hundreds of ways to read and interpret this set of commands - from taking a vow of poverty like the monks, to the life of J.C. Penney who gave away 90% of his earnings, living on 10% towards the end of his life (of course, he was a multi-millionaire). Matt 7:1-5 - Do not judge, or you too will be judged. Like the previous command, this one has hundreds of interpretations. The basic message is clear: be careful how you judge others and do not have double standards. Matt 7:6 - Do not give dogs what is sacred; do not throw your pearls to pigs. Any serious Christian will give you what they think this means, but it certainly is not crystal clear. This ends the Sermon on the Mount and the reader should quickly see that Jesus says several things that are just not so clear. Yes, a person CAN take ALL of these at face value and live them, but nobody does! I have NEVER met a single person who was missing an eye or a hand because they were following the sayings of Jesus literally. Remember, Taylor insisted you could not REALLY be a follower of Jesus if you are not following His teachings. Luke 18:22 - Sell everything you have and give to the poor, and you will have treasure in heaven. Then come, follow me. Luke 14:26 - If anyone comes to me and does not hate father and mother, wife and children...even their own life — such a person cannot be my disciple. Matt 16:24 - If anyone wishes to come after Me, he must deny himself, and take up his cross and follow Me. This is a great example. Unlike the "love your enemies" verse the pacifist uses, this verse is a clear conditional call: "If anyone wishes to come after Me." A literal reading of this verse is stating quite clearly that IF you fail to "deny" yourself and "take up your cross" you cannot follow Jesus. Now the pacifist will tell you that non-resistance IS fulfilling this verse, but I would ask Taylor and/or Bercot, "Are you denying yourself every single day? Do you carry your cross every single day?" But somebody has to explain and interpret what "carry your cross" even means; what "deny yourself" means. Neither of these are crystal clear, yet this teaching of Jesus is conditional: IF you do NOT do this you cannot follow Him. The "love your enemies" and "turn the other cheek" verses do not have this clear conditional affixed to them! Yet Taylor/Bercot and their Anabaptist friends have built their foundational doctrinal stance around these verses. I have just listed seven commands within the Sermon on the Mount that are not clear. Almost ANY scholar is going to explain these verses by saying that Jesus uses hyperbole and analogy in His teachings - Taylor, I think would say this as well. Most important is that these verses appear in the same pericope (the same unit of text) which means that the same interpretational method should be used generally speaking. In addition to these seven, I have listed three more sayings of Jesus that are not crystal clear or at least do not have clear application to each and every Christian for all time. And I could find several others. The point is: we MUST interpret these sayings. Even if Taylor/Bercot were to say that some should be explained while others are crystal clear - they have used an interpretation model to come to that decision. In his presentations Taylor basically says, "You cannot pick and choose which texts you will take at face value and which ones you will exclude." He uses a nice quote from Kierkegaard in his closing statement to make this point. BUT Taylor himself does exactly this! He cannot defend himself against this charge. He has both eyes, both hands and his tongue - and I know he has sinned with his tongue - I witnessed it myself, albeit in a video. Thus Taylor's use of Kierkegaard was good preaching, but it was rhetoric. He was using Kierkegaard to protect him from sound thinking, from using the logic God gave mankind which is part of His image stamped onto our being. My main problem with the Anabaptist/non-resistant position is more basic. Most of my interactions with Christians holding this position has been marked by their not-so-subtle attitude of spiritual superiority. Based on your comments [to the pacifists], this appears to be a salvivic issue. Thus, are you concerned for the souls of Kreeft and Charles? Dean Taylor answers the question with a question: "Can you be a follower of Christ without following the teachings of Christ?" The implication is that he does not think Kreeft/Charles are truly Christian. Bercot gives a good answer: his camp believes war and killing is "sin," but they cannot and should not judge. This point begins with the Apostle's Creed, incarnation and the resurrection, but something tells me when it says "denying the gospel" they are not talking about these cardinal doctrines, but what most of Christianity calls a secondary issue - pacifism. This is borne out with the following point where earthly allegiance and Constantine are invoked. This is very similar to The Mennonite Church which has 24 Articles of Faith. Articles 10,22 and 23 contain clear comments on pacifism: "we do not prepare for war, or participate in war or military service," Article 22; "Peace and justice are not optional teachings, counsel that Christians can take or leave," Commentary on Article 22. The problem here is their definition and doctrine of "Peace and justice" are not clearly presented in the New Testament. The utter refusal of self-defense can certainly be a personal choice, but to make it a primary doctrine is nothing more than sectarianism. Making it a primary doctrine is to exclude ALL other expressions of Christian faith. The panel is discussing the results of war and violence surrounding the conflict in Rhuwanda and how to deal with large-scale evil, Taylor says "these murderers were Catholics taught that just war is allowed." Kreeft goes back to his hypothetical asking what Bercot would do if an armed lunatic entered his house: would he allow the man to kill his children or would he use force? Time Mark: 1:01:51 Bercot adds to the offensive comments Taylor made by saying, "We must live sheltered lives because somehow these things never happen to non-resistant Christians, it's always the Catholics and Evangelicals who know about homicidal maniacs who break into your house...I've talked to Mennonite after Mennonite, 'Has this ever happened to you? Do you know of anyone this happened to? There is something to the idea that God can protect our families...and I would say that we are victims of crime far less than Christians who rely on guns to protect them.'" Bercot goes back to Rhuwanda saying that "you are taking two sets of Christians who are not non-resistant, they start slaughtering each other, then you throw it to us asking us 'What would you do?' Wait a minute. These are your people who are slaughtering each other...that's your problem. What would we do? We would teach that Christians don't kill. Obviously, that is not what they were taught." Taylor and Bercot both sound like the man who lifted his hands in prayer saying, "Oh God, I thank you that I am not a sinner like this other fellow..." Do these guys really believe that their communities are immune from the evil in the world? These were arrogant, rude and offensive comments. Charles and Kreeft were very gracious in response. I would have called them out right there. Anabaptists die from cancer, accidents and violence just like any other subgroup. Even IF they could show statistically that their communities are more protected by God, their "arrogance is like the evil of idolatry." 1 Sam 15:23. So they are murderers. Yes, Taylor likes to push the idea that Jesus really meant what He said. Speaking of how His followers were not to murder, Jesus says even if you speak harshly against someone (they are speaking arrogantly and judging the Catholic brothers...implying that they are NOT brothers) you are subject to the fires of Hell (Matt 5:21). Is this unfair? Am I misreading the text? I think I am reading the text just as they are doing - and I am offering that they be judged with the same measure they have used to judge others. The exclusive views held by the Anabaptist/pacifist groups is typical of what we call a cult. They have incorrectly interpreted and applied texts to be of primary importance, accused other Christian groups who do not share their views as "denying the gospel," and basically claimed to be the ONLY ones following Christ.